Last night I had the pleasure of seeing “Now You See Me” and was surprisingly delighted with the fairly original story, the humor, and the fast pacing. 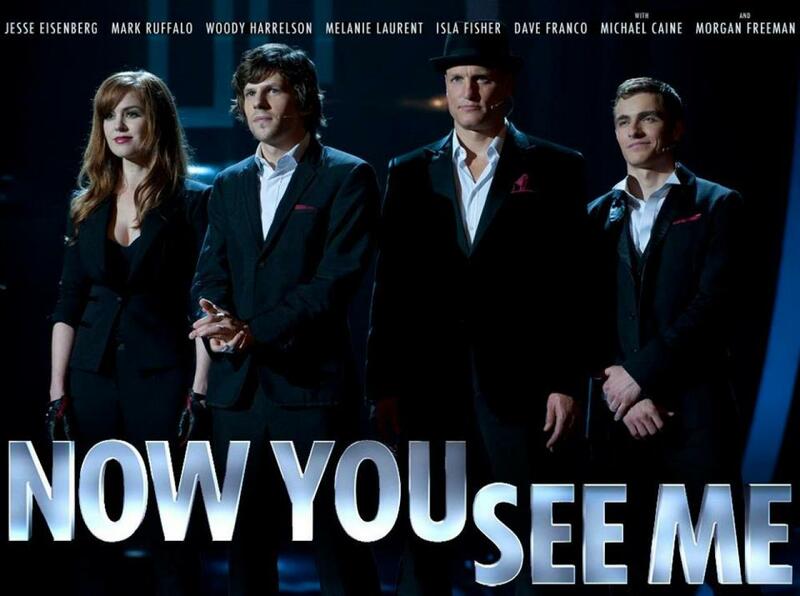 “Now You See Me”, directed by Louis Letterer, known for directing the great “The Incredible Hulk” starring Edward Norton, stars Jesse Eisenberg, Woody Harrelson, Michael Caine, Morgan Freeman, Mark Ruffalo, Isla Fisher, Dave Franco, and Melanie Laurent. Esienberg, Fisher, Harrelson, and Franco, are the Four Horseman of magic. They are united simply by a calling card that features an Egyptian eye on it. All of these individuals bring their own type of magic to the table as well. Franco, Jack Wilder, is good with what I would deem, hand magic, meaning card tricks, spoon bending tricks and fighting people. Harrelson, Merrit McKinney, is a mentalist meaning that he uses target guessing and hypnotism to ascertain what an individual is thinking. Eisenbgerg, Daniel Atlas, and Fisher, Henley Reeves, are both performance magicians. They love the stage and the big finish. They are all brought together by a mysterious figure who has a plan for a series of performances, involving the robbery of banks and individuals. Freeman, Thaddeus Bradley, becomes acquainted with the group when they begin their performances because he is a famous magic debunker and Michael Caine, Arthur Tressler, is involved with this group because he is the financier of their first few shows. Once, the group does begin to successfully rob some banks, Ruffalo, Dylan Rhodes, and Laurent, Alma Dray, become involved as Rhodes is the F.B.I. agent interested in catching these individuals and Dray is an INTERPOL agent determined to do the same. This movie features an all-star cast, with a fairly decent script, and one hell of a twist. Before I begin the actual review, I would like to say why I believe this movie was destined to beat “After Earth” in the showdown this past weekend. First off, Shyamalan’s directing is no longer a boost but a hindrance now. I think this occurred even before “After Earth”. The cast of “After Earth” features predominantly Jaden Smith over Will Smith and does not hold a flame to the all-star cast of “Now You See Me” so right there are two major differences that account for the winner in this showdown. After coming in third in the box office records, Will Smith stated that he wanted to focus more on indie movies rather than blockbusters and I, for one, am certainly glad he has decided it. I love Will Smith, don’t get me wrong, but he could be doing so much more than just starring in July 4th mega movies. So, all in all, I enjoyed this movie. It is very fast paced and there are some moments that appeared rush and could have used some further toning down. One big problem I had with this film, was the sweeping camera shots. Seriously, Letterier went above and beyond with these shots so much in fact that I nearly hated this movie specifically for that reason. However, what did save it, was the twist ending and it was fairly unpredictable. It put a lot of things in perspective after it occurred and I think that’s what really made this film. The humor was also well worth it. I don’t know how much free rein Harrelson was given but he was given enough to make some hilarious quips that were true to him and just made the movie that much better. Eisenberg is also quite good in this film. Just the right amount of cocky and it appears as if he is showing some Mark Zuckerberg in this role. All in all, I would say that those two members really stood out to me because there wasn’t a lot of time for character development, and I guess this movie suffered slightly for it. The audience is shown these people and then they are doing something and then the movies over. I’m not going to admit that this movie dropped in my regards because of that but it would have benefited from a little character development.